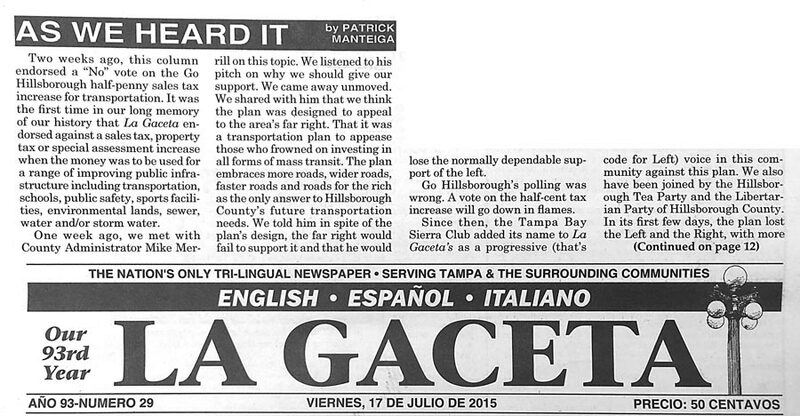 Patrick Manteiga, editor of the tri-lingual newspaper La Gaceta, wrote a thorough analysis and major trashing of Go Hillsborough, the county’s push to raise our sales tax to pay for some transportation projects — mostly roads and road improvements, with relatively little for mass transit. La Gaceta is not published online, so I’m printing his July 17 column here, as well as his July 24 follow-up, because it’s an important addition to the conversation. Go Hillsborough also hopes that the City of Tampa will use a large piece of its pie for some sort of rail project between Downtown and TIA. But why should Tampa use its money for rail while it has potholes and the County gets to use its money for potholes instead of rail? Merrill explained to us that this is the transportation plan the people want. This is the maximum they will pay and that they prefer a sales tax over a gas tax, property tax or impact fees. He seems to believe it and bases his faith on Go Hillsborough’s work with our citizens in workshops, focus groups, telephone town halls, a poll and the 3,000 likes Go Hillsborough got on Facebook. Several readers called us regarding last week’s column on the transportation tax. All were in agreement that they did not like where it was heading. We even spoke with Former Mayor Pam Iorio, who helped lead the last effort to increase the sales tax for mass transit funding. She was disappointed that this plan focuses on maintenance and new roads and offers little for building a mass transit system. The County better wake up to the fact that this plan is doomed. After we wrote last week’s column speculating this bad plan was only moving forward to financially benefit the consultant, the County offered a contract extension for $350,000 plus. The only infrastructure that will be improved by this effort is the upgrade to the lifestyles of the Go Hillsborough consultants — Parsons Brinckerhoff and Beth Leytham. Previous story Sierra Club on county’s proposed sales tax increase: better growth policies and other transportation solutions should come first.